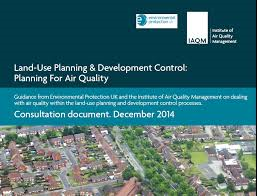 Consultation now open on new EPUK and IAQM guidance: “Land-Use Planning and Development Control: Planning for Air Quality” – February 16 2015 deadline. STEP welcomes the revised guidance which will help to ensure that air quality is adequately considered in land use planning and development control processes. The guidance emphasises the importance of applying best practice measures to all developments, to both reduce pollutant emissions, and human exposure to emissions. While this guidance applies to the planning system in England and Wales, the general principles contained in the document are applicable across the United Kingdon. A separate document will be adapted for use in the Scottish planning system. The full consultation document can be viewed here. Comments should be sent to planning@iaqm.co.uk before the closing date of 16 February 2015.